SQL SERVER Architecture PART - I is covered here. 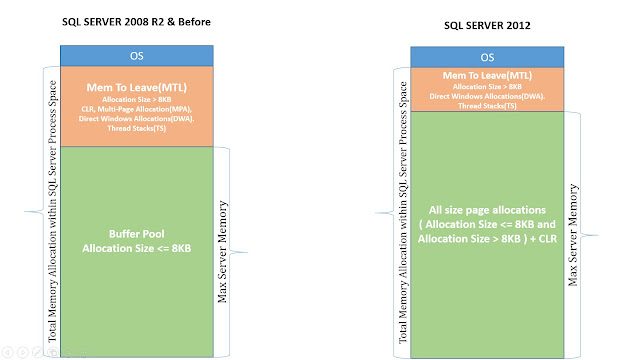 By default, SQL Server manages its memory resources almost completely dynamically. 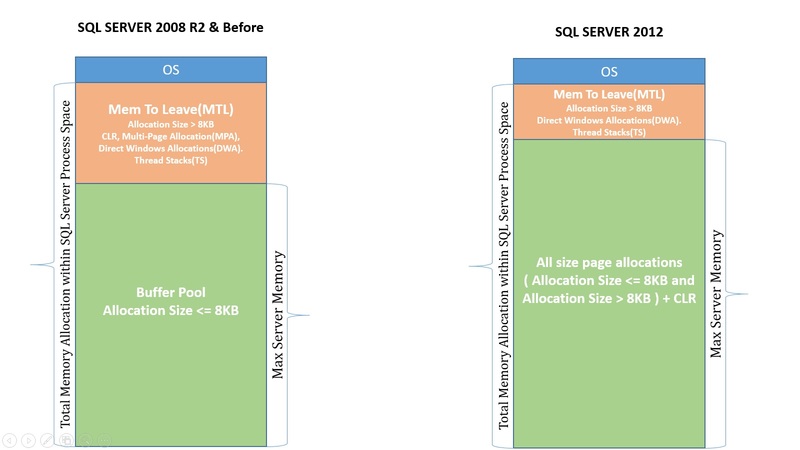 When allocating memory, SQL Server must communicate constantly with the operating system, which is one of the reasons the SQLOS layer of the engine is so important. Buffer is a page in memory that's the same size as data or index page. Buffer pool is the memory in which all frequently used data pages(data cache) are kept which are read from disk and also the new insertion rows. Buffer manager is responsible for bringing the data to buffer pool from the disk whenever it requires. 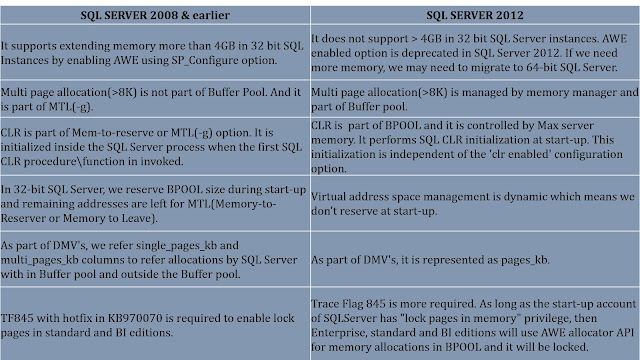 From SQL Server 2012 onward, all size of page allocations and CLR space allocation can be located inside the buffer pool itself. Pages in the data cache are hashed for fast access. Hashing is a technique that uniformly maps a key via a hash function across a set of hash buckets. A hash table is a structure in memory that contains an array of pointers (implemented as a linked list) to the buffer pages. Every buffer in the data cache has a header that contains information about the last two times the page was referenced and some status information, including whether the page is dirty (has been changed since it was read in to disk). The reference information is used to implement the page replacement policy for the data cache pages, which uses an algorithm called LRU-K(Least Recently Used] in which K value of 2, so it keeps track of the two most recent accesses of each buffer page. An LRU-K algorithm keeps track of the last K times a page was referenced and can differentiate between types of pages, such as index and data pages, with different levels of frequency. 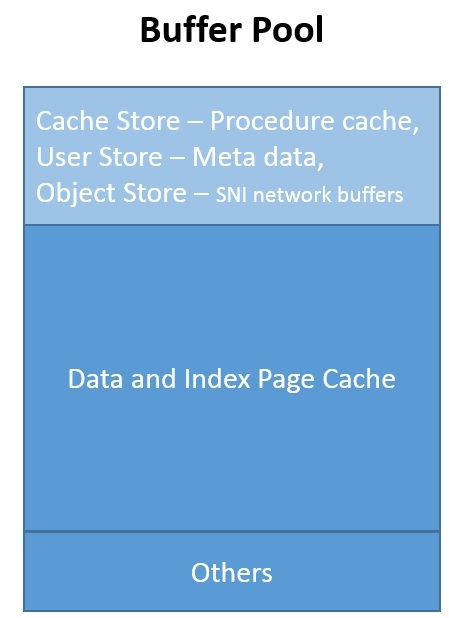 Cache stores - Example. Procedure Cache. User stores - Example. Meta data cache. Object stores - Example. SQLServer Network Interface(SNI) which leverages the object store for pooling network buffers. 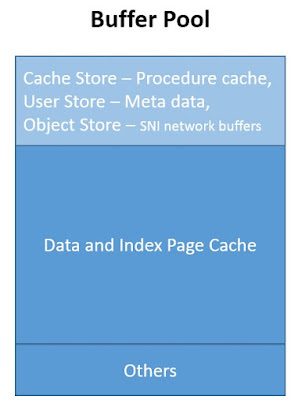 Both cache stores and user stores use the same LRU mechanism and the same costing algorithm to determine which pages can stay and which can be freed. Object stores, on the other hand, are just pools of memory blocks and don’t require LRU or costing. Lazy Writer examines the size of the free buffer list. If the list is below a certain threshold, which depends on the total size of the buffer pool, the lazy writer thread scans the buffer pool to repopulate the free list. As buffers are added to the free list, they are also written to disk if they are dirty. Checkpoint process scans the buffer cache periodically and writes any dirty data pages for a particular database to disk. The difference between the checkpoint process and the lazy writer (or the worker threads’ management of pages) is that the checkpoint process never puts buffers on the free list. The purpose of the checkpoint process is only to ensure that pages are written to disk, so that the number of dirty pages in memory is always kept to a minimum, which in turn ensures that the length of time SQL Server requires for recovery of a database after a failure is kept to a minimum. Memory management in the stores takes into account both global and local memory management policies. Global policies consider the total memory on the system and enable the running of the clock algorithm across all the caches. 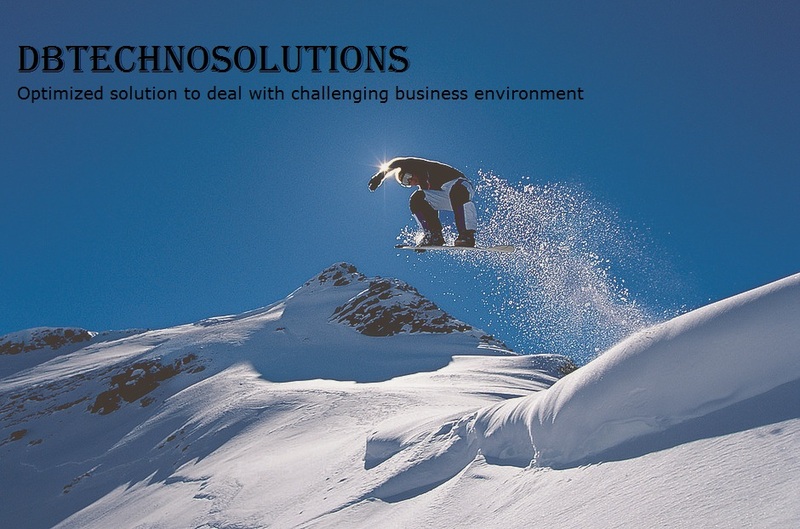 Local policies involve looking at one store or cache in isolation and making sure it is not using a disproportionate amount of memory. To satisfy global and local policies, the SQL Server stores implement two hands: external and internal. Each store has two clock hands, and you can observe these by examining the DMV sys.dm_os_memory_cache_clock_hands. This view contains one internal and one external clock hand for each cache store or user store. The external clock hands implement the global policy, and the internal clock hands implement the local policy. The Resource Monitor is in charge of moving the external hands whenever it notices memory pressure. Because memory is needed by so many components in SQL Server, and to make sure each component uses memory efficiently, Microsoft introduced a Memory Broker late in the development cycle for SQL Server 2008. The Memory Broker’s job is to analyze the behavior of SQL Server with respect to memory consumption and to improve dynamic memory distribution. The Memory Broker is a centralized mechanism that dynamically distributes memory between the buffer pool, the query executor, the query optimizer, and all the various caches, and it attempts to adapt its distribution algorithm for different types of workloads. 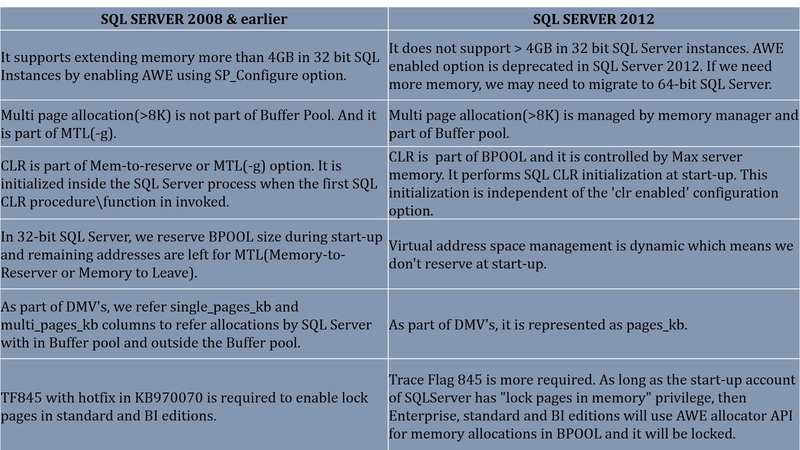 Main differences between SQL Server 2012 with older versions. Also find below Memory manager responsibility difference between SQL Server 2012 with older versions.